Mellow Space is excited to be a part of the upcoming SUMMER SESSIONS at the Lost Lot in Echo Park. We will only be bringing our extensive and one of a kind, vintage ash tray collection for sale. Most of you know us for our unique vintage home decor and kitchenwares at the Silver Lake Flea. We have had an overwhelmingly positive response to the ash trays we carry and we have grown our inventory nearly ten fold since we first began selling at the fleas only a year and a half ago. 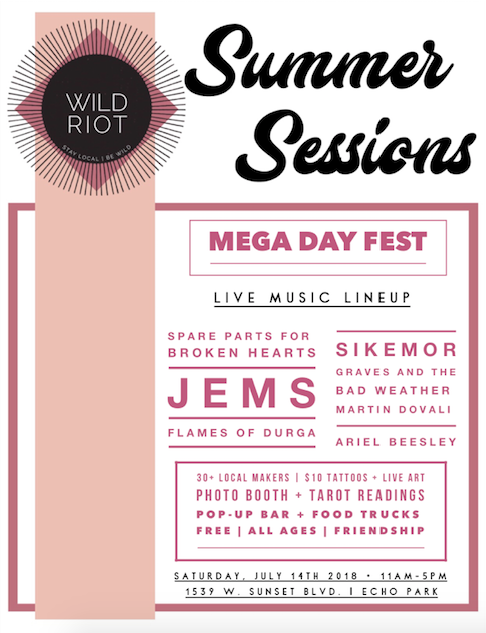 Wild Riot will be hosting an outdoor stage which will be home to over 25 bands + DJ’s throughout the summer, alongside an artistic playground which will feature over 40 local artists + makers, $10 tattoos, live muralists, tarot + energy readings, photobooth, jumbo yard games, free yoga, food trucks + a pop-up bar, and a chill zone where you can cool off + chill out in on hammocks and enjoy tons of freebies! With our mission being to bring local creatives together in the name of collaboration + building community, we have fought hard to represent local artists / makers / brands / charities / musicians + small businesses in our community and we're proud to say, this series is for YOU.